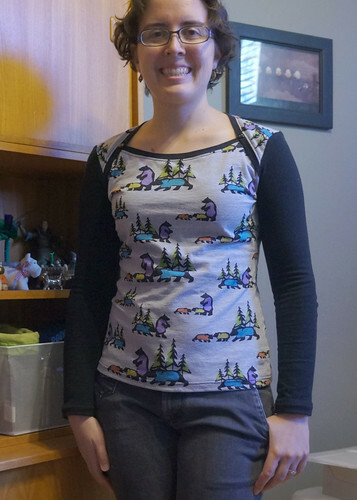 I made up another Bronte top after my yellow one! 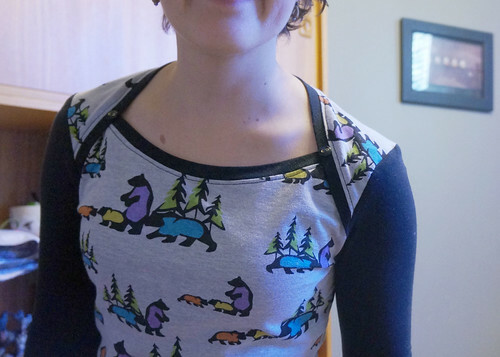 This one is from much more recent stash than the first one; I bought these knits from Girl Charlee late in the summer of last year (it is so weird to think of 2014 as “last year”). 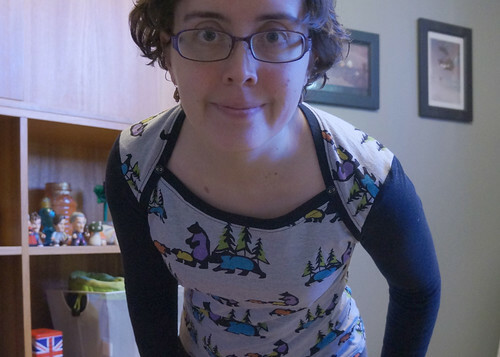 I only bought a yard of the bear fabric (there is also a matching moose fabric! ), and I bought the black intending to use them together. I think my thought was that I’d temper the crazy with a little bit of solid colour. I shortened the sleeves 3″, all the while thinking “Really? Do I really want to shorten them this much? I must be wrong.” Nope, 3″ was just right! I find it odd I didn’t need to shorten the body at all, if I was making such a big adjustment to the sleeves. Even though the print on this one is arguably child-like (I LOVE PRINTS, DON’T CARE) I think the black trim and sleeves make it much less onsie-ish that an Easter-egg-yellow Bronte. Something obvious to note – when you make a muslin, with the intent of making the pattern again in your ‘good’ fabric, make sure that they’re similar fabrics? I mean, yes, I sewed both of these out of jersey, but that’s about where the similarities end. When I first put the bear-Bronte on, I thought “uh oh, too tight”, because the jersey is a lot thicker and less stretchy. Luckily, it seems a little like a pair of jeans, in that after a bit of moving around, it eases up. I opted for just one button each side this time, because I had these fabulous black plastic buttons with brass-reinforced holes. Yes, I made the sewing machine do them for me. Never sewing another button by hand ever again! At home at least, unless I can figure it out on the sewing machine at work. I haven’t noticed any difference yet in strength of seams or anything, but the main draw (for me) was that it is straight, not zigzag, so I can press the seam allowances open, rather than to one side when they’re zigzagged together. How often do you read your machine’s manual? I’ve found all sorts of fun stuff (IT SEWS ON BUTTONS) in mine, and there’s only 40 pages! 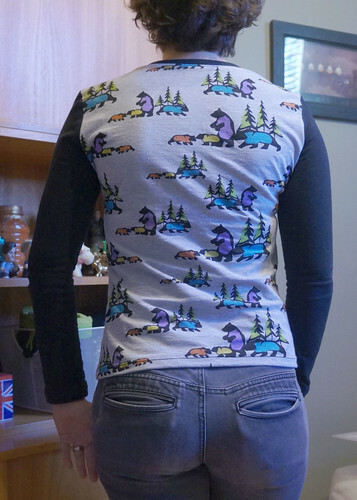 This entry was posted in Sewing and tagged sewing knits by rycrafty. Bookmark the permalink. My machine sews on buttons too, and I love it! So much quicker. I love knit prints too, and girl charlee has so many good ones. Another great make! whoah t?is blog is wonderful i l?ke studying you? articles. round f?r this ?nformation, you ?ould aid them ?reatly. I like this web blog very much, Its a real nice billet to read and get information. “If at first you don’t succeed, you’re running about average.” by M. H. Alderson.